The Oil Drum: Europe | How Close will the U.K. Come to Running Out of Natural Gas in Storage this Spring? How Close will the U.K. Come to Running Out of Natural Gas in Storage this Spring? Apart from a colder than normal winter, a considerable contributor to the growing use of storage withdrawals to balance demand this winter has been an accelerated decline rate in indigenous U.K. marketable natural gas supplies--recently as high as 17% on an annual basis. The diagram shows the development of the YOY (Year Over Year) decline/growth rate for U.K. marketable natural gas supplies from January 1996 to January 2010. A smoothed 12 MMA (12 Month Moving Average; white line) has been added. Figure 01: The diagram shows development in total working natural gas in U.K. storage for the contractual years 2005 - 2009. Figure 02: The diagram shows total U.K. net natural gas withdrawals between December 1st and March 31st for the contractual years 2005 - 2009. Figure 03: The diagram shows total U.K. storage withdrawals/injections between December 1st 2009 and as of now. In the diagram is also shown a 7 DMA (7 Day Moving Average). Figure 04: The diagram shows developments for natural gas in storage in LRS (Long Range Storage) for the contractual years 2005 - 2009. Figure 05: The diagram shows developments for natural gas in storage in MRS (Medium Range Storage) for the contractual years 2005 - 2009. Figure 06: The diagram shows developments for natural gas in storage in SRS (Short Range Storage) for the contractual years 2005 - 2009. Figure 07: The diagram shows total daily natural gas injections/withdrawals during the refilling period in 2009. A 7 DMA (7 Day Moving Average) is added to smooth the data. Injections have been defined to be negative and withdrawals as positive (adds supplies). Figure 01 (shown previously) illustrates that storage facilities have reached around 90 % filling by end of August in each of the years shown. Figure 08: The diagram shows the development of U.K. natural gas gross imports and the composition of the imports. Belgium does not export natural gas, but this is gas imported through the Interconnector between Zeebrugge in Belgium and Bacton in U.K. from other sources and ultimately most likely Russia. A major contributor to the steep increase in U.K. natural gas imports is the accelerating decline rates with respect to U.K. marketable natural gas supplies. Marketable natural gas supplies means natural gas that arrives at end users--that is, gross production adjusted for producers own use, operators own use and metering differences, etc. Figure 09: The diagram shows the development of the YOY (Year Over Year) decline/growth rate from January 1996 to January 2010. A smoothed 12 MMA (12 Month Moving Average; white line) has been added. The smoothed line shows how the annual decline rate has accelerated from around an annual rate of around 5 % as of July 2009 to around 17 % as of January 2010. 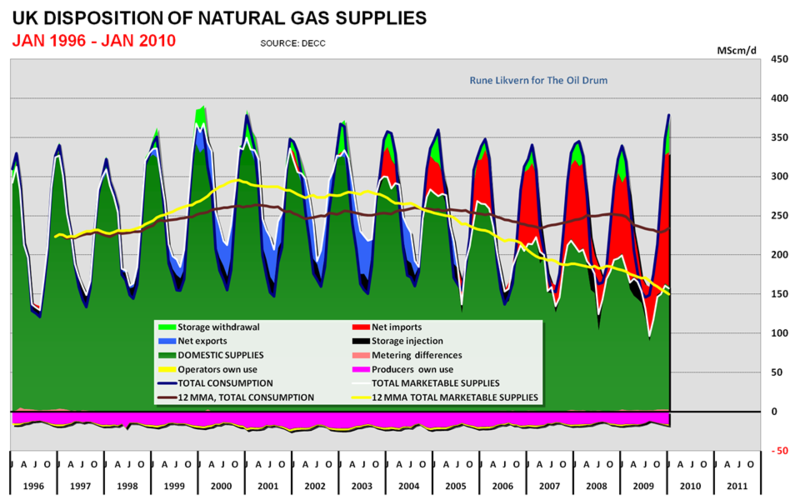 From January 2009 to January 2010, U.K. marketable natural gas supplies declined from 199 Mcm/d to 158 Mcm/d. The steep annual decline rate is the proverbial “elephant in the room”. Based upon data for U.K., proven natural gas reserves as of end 2008 the R/P (Reserves divided by Production) ratio has been estimated at 4,3 as of end 2008 and as of end 2009 preliminary estimates for R/P results in a similar ratio. This suggests that annual decline rates of 15 - 20 % for U.K marketable production should be expected for the near future. Continental Europe and U.K. have mutually benefitted from the bidirectional Interconnector between Bacton and Zeebrugge. For the period 1998 to 2004, this allowed U.K. to be a net exporter of natural gas to Continental Europe. Recently the Interconnector has allowed for U.K. exports during the summer and imports during the winter as illustrated in the diagram below. Figure 10: The figure shows, on a monthly basis, the flow direction of natural gas through the Interconnector for the Contractual Years 2007 - 2009 YTD (Year To Date). Figure 11: The diagram above illustrates how the differential flow in the Interconnector has developed from Contractual Year 2008 to Contractual year 2009 YTD. The way the diagram is to be read is that for any day, for example January 11th, U.K. imports in 2010 were 34 Mcm versus U.K. exports of 45 Mcm in 2009. This creates a differential of 80 Mcm for January 11th. One way to describe this is that Continental Europe saw around 80 Mcm less imports from U.K. on January 11th 2010 versus the same date in 2009. Inasmuch as Continental Europe’s natural gas production has been in general decline in recent years, one might expect this decline to give rise to a similar additional amount of natural gas imports, mainly from Norway and/or Russia into Continental Europe. I don't think a lot of readers understand how "close to the edge" Britain is, in many ways. You talk in this post about almost running out of natural gas in storage this winter. Next winter is likely to be worse, because new storage won't yet be built, and UN natural gas supplies will be down even further. If gas in storage runs out, commercial customers with interruptible contracts will certainly have to be cut off, but it seems like it might be worse than this--perhaps cutting back on electrical production, if the situation is too severe. Of course, even cutting off business for weeks would have severe economic consequences. The above article talks about the massive need for new electric power generation in UK, and the fact that nuclear and wind will be very expensive, so investors will want to build new gas plants. But if gas is also running into limits, based on what Rune says, this may not be such a good option either. At a minimum, additional storage capacity is needed, so the UK does not run out of natural gas in storage, if production declines or use rises. If the recession ever goes away, there would likely be a real problem. But these issues (natural gas storage and electricity) work together. Both demand big investment to try to fix the problems. And the gas problems make fixing Britain's looming electric problem all that more difficult to solve. Who runs into trouble first? A year ago I wrote some posts about U.K. natural gas storage based upon simulations using SND (Seasonal Normal Demand) figures from National Grid. The simulations came out with the alarming prospect that U.K. could completely drain their storage facilities by late February 2009. Well it did not happen! U.K. has the flexibility to switch some electricity production from natural gas to coal and nuclear. The diagram above shows how less natural gas was used for electricity generation during January and February 2009 compared to the same months of 2008. Note also how natural gas for electricity generation again has grown recently. An estimate shows that around 1 200 Mcm less natural gas was used for electricity generation in January and February in 2009 compared to the same months of 2008. 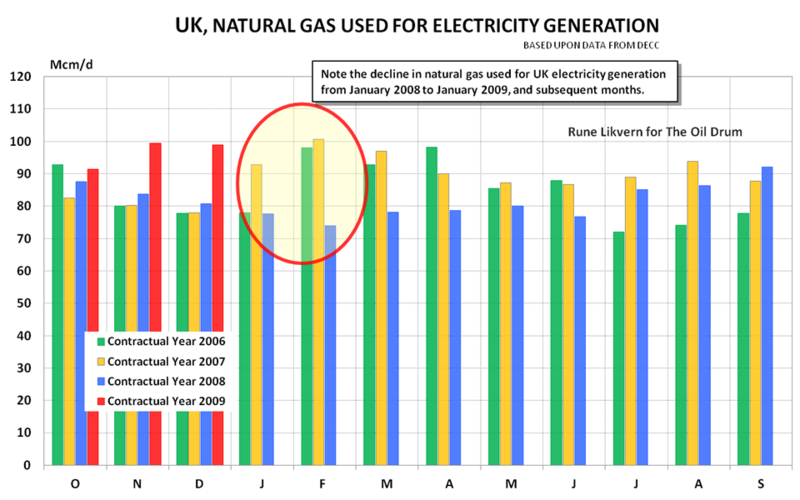 Total natural gas in U.K. storage at end of February 2009 was……………..1 200 Mcm! This suggests that besides the economic down turn, and thus reduced demand for natural gas and electricity, that this fuel switching reduced natural gas drawdown from storage and thus preserved demand for other users. From what I understand U.K. will use natural gas for electricity generation to bridge a transition from coal and nuclear. This suggests that generation of electricity from natural gas will grow in the near future. This impression becomes reinforced from the initiative to build huge offshore wind farms. Electricity from large scale wind is dependent on built infrastructure and that there is alternatives available to be promptly brought in to meet demand when wind generation is low and electricity demand is high. Natural gas fired power plants have this responsiveness. I can not see any natural gas used for electricity generation in January and February in 2009? The diagram shows contractual years. Contractual Year 2008 starts October 1st 2008 and ends October 1st 2009. This means that January 2009 is found in January for Contractual year 2008. I think there are multiple things going on with the need for new UK generation--old nuclear plants being decommissioned, coal plants being replaced, and perhaps some new electricity capacity being added at the same time, contributing to the higher need for new electricity generation.. The cost of offshore wind will be very high (more than twice the cost of nuclear), making me doubtful that the economics will support building very much of it. Maybe natural gas is the best resource Britain has, especially if nuclear isn't trusted. It just seems a little strange to be depending on natural gas, if indigenous supply is declining, and we don't know how long the other sources of gas will be available in adequate quantity. That has also been my thoughts Gail. It would have been interesting to see how electricity generated from natural gas now compares to offshore wind. Is that before calculating the cost overruns and failues of fission plans, or after the cost overruns and failures of wind machines? Excellent, well illustrated post Rune. My concern is the second dash for gas, currently underway by UK power generators. There has been considerable discussion about the UK Energy Gap, expected about 2015, when many of the large coal burning power plants are decommissioned under the EU Large combustion plant directive LCPD. However, the power generators have known about this issue for years, and back in 2007 a further 9GW of CCGT generating plant was fast-tracked through planning permission, with applications submitted for an additional 7GW. Some of this additional capacity is now under construction, and there are plans for up to another 15GW of CCGT in a second wave of construction in about 2020. The exception to the proposed CCGT plants put through planning in 2007, was the pair of 800MW advanced coal plants proposed at Kingsnorth. Whilst every climate-campaigner was getting hot and bothered about Kingsnorth - half of the proposed CCGT plants passed quietly under the "planning" radar. The utilities will always follow the cheapest option that maximises returns for their shareholders - and this means building a load more low cost CCGT plants, on the sites of existing coal plants - not a few very high cost nuclear plants or offshore wind - deemed risky by investors. These new plants, when operational, will put a considerable extra burden on Britain's gas consumption* - and also reduce the diversity of the UK generation mix - putting some 60% +, of UK generation wholly at the mercy of imported gas supplies. Clearly this does nothing for UK Energy Security. * 16GW of CCGT generation is estimated to use the equivalent gas of an additional 9.5 million UK homes. This is based on a CCGT overall production and distribution efficiency of 42% and a typical UK home using 100kWh of gas on a winter's day. This pattern of increasing LNG imports and declining exports to Continental Europe is expected to continue. Why would the UK export and import LNG? Surely if there is a shortage, then wouldn't you simply stop exporting to reduce importation? There must be some bit of information I'm missing here. When the UK energy industry went 'Chicago economics' with Thatcher, it was bought by foreign investors. They will do whatever makes them money, while UK gov is too lazy and incompetent to notice. The problem is that the storage volumes are not big enough. When the UK was producing a lot more gas they did not need massive storage facilities. Production could cover winter needs. As production declines, you find you have more than enough in summer but in winter you need to import, or watch your storage go to zero. The diagram shows the development in U.K. disposition of natural gas from January 1996 to January 2010 . On an annual basis U.K. again became a net importer as of 2004. Further U.K. became a year around net importer as of 2007, ref the red areas in the above diagram also for refilling of storage facilities. I am of the opinion that the U.K. natural gas storage system was a good and cost efficient as long U.K. indigenous production grew. And as pointed out by speedy and shown in the diagram above, the swing in demand could be taken by the offshore production installations. Recently the U.K. installations have lost some of the swing flexibility, and as also illustrated in the diagram, the swing is increasingly handled by exporters and storage. I have noted a difference between the U.S. and U.K. system whereas the U.S system to a larger extent produces almost flat throughout the year and storage is mainly used to take the seasonal swings in demand. In U.K. this swing has been designed into the production installations, offshore pipelines and receiving terminals. In other words in U.S. it must have been considered more cost efficient to use storage to handle swings, while in the U.K. the swing has been designed into the production system which suggests this was found to be more cost efficient. "storage volumes are not big enough" well our incompetent government has decided against building larger national stocks of gas. A spokesman for the Department of Energy and Climate Change declined to comment, but added that it had been reluctant to sanction national storage in the past for fear of discouraging commercial investment!!!!!!!!!! There is nothing in the quote that explicitly suggests that U.K. is importing and exporting LNG, though it could now happen as U.K has increased import capacities for LNG. Figure 10 in the post illustrates how imports and exports from U.K. through the Interconnector (Bacton - Zeebrugge) has developed during the recent 3 Contractual Years. I understood that quote to mean that the declining exports were of natural gas, not LNG. I understand these to occur during certain times of the year, when UK production is high, but demand is low. If UK production is dropping, then the gap between production and demand will get smaller--hence fewer exports--even in the "best" times of the year. The UK exports NG because of contractual obligations. They have to export when the customer on the other side of the pipline demands it even if they don't want to. Excellent review Rune. It looks like the UK will squeak by this year but next year is an open question. Idigenous UK production of energy from all sources is down 40% since 2000. If natural gas production continues to decline at the high rates you mention, it is very unclear how the UK will meet their energy needs in the next cold winter. Imported LNG seems to be the only current option but I have posted before on the dangers posed by China's 30-year contracts with natural gas providers around the world. If you also look at the growth rates for natural gas consumption in the developing world you will come away with the impression that developing world consumption will increase at least as fast as the anticipated increases in LNG availability. I am therefore very skeptical that LNG will remain as inexpensive as it is this winter. The UK really has no choice but to embark on a massive energy conservation program. And they need to start yesterday! Actually I think we did - the only way I know of affordably reducing energy consumption by the amounts required on an ongoing continuous basis is recession. In the UK everything to do with energy (either production or conservation) requires massive investment - for now at least, that seems to have gone away in what looks to be a self-reinforcing loop. Hello Jonathan and thank you! As of now U.K has a total LNG import capacity of around 45 Gcm/a (Bcm/a) and as of 2008 the total global trade in LNG was around 226 Gcm (Bcm). U.K. imported close to 10 Gcm (Bcm) LNG in 2009 and it certainly will be higher for 2010, probably in the range of 15 - 18 Gcm (Bcm). There are in other words now LNG receiving capacities in U.K. to offset any decline in indigenous production the next heating season. As you point out several of the emerging economies are locking LNG supplies into long term contracts, and their LNG consumption is growing. LNG is a fungible commodity, in other words it will flow to the highest bidder. EIA in their STEO (Short Term Energy Outlook) for March 2010 projects a price for U.S. natural gas (Henry Hub) at around US$ 6/Mcf for 1.st quarter of 2011, which now translates into 40 p/therm. This suggests that natural gas prices at NBP (National Balancing Point) will move up next winter and could also make U.S. compete for LNG. LNG is fungible up to a point. every train produces LNG with different specs, the most important one is probably the BTU content. LNG from different sources has different energy contents and you can't just put high cal gas into a low cal system - houses will burn down. The bulk of LNG sales is on longer term contracts. The spot market (as we know it to exist for, say, oil) does not really exist because LNG evaporates on you. What is called "spot market" for LNG generally refers to contracts of less than one year. Globally the receiving capacity for LNG is about 3X or so that of the compressing/manufacturing capacity. It is much cheaper and quicker to build a regas plant than it is to build a compression train. In a way a regas plant is a relatively cheap call option on increasing domestic NG prices. I was aware of that there were different specs on LNG, but was not aware of that the energy content could vary that much. I have been given the impression that LNG is mainly methane, or low calorific gas. Pipeline systems may operate on high and low calorific gas which may cause problems at the burner tip if mixed and not kept within the bands in the specifications. Do you have any references on this (LNG)? engineering-wise, is it not a trivial cost to inject nitrogen into hi-cal gas to meet lower cal system specs (as they do in germany and holland)? every train produces LNG with different specs, the most important one is probably the BTU content. LNG from different sources has different energy contents and you can't just put high cal gas into a low cal system - houses will burn down. If there are heavier components in the LNG, i.e. ethane, propane, and butane; why don't they just fractionate them out before they reach the consumer and sell them separately, e.g. to a petrochemical plant? They are a lot easier to liquefy and ship than straight methane, so why didn't they fractionate them out at the source and ship them separately? I'm used to on-shore operations where, if there were heavier components in a gas stream, someone would put a straddle plant on the pipeline, strip the ethane, methane and propane off, and sell them for a profit. I've worked for companies that made more money doing this than selling natural gas, so I'm having trouble understanding what the problem is. I really believe we are watching the Peak Energy crisis unfold in the UK quicker than anywhere else at the moment. The UK has declined from a first world superpower, once the world's largest manufacturer and a major exporter of oil & gas to a nation bankrupt economically and bankrupt in energy resources. The UK (just like the USA) has destroyed its manufacturing base and given away lots of its fossil fuel wealth becoming in the process a net importer of both goods and energy. To keep the economy humming the UK became a financial economy and expanded immigration and the development of the unsustainable subutban consumerist lifestyle. We know now what a disaster this has been. We are watching a first world nation convert itself into an overcrowded poor (bankrupt)third world nation. Recently on TOD we had a post on the Nord Stream pipeline canada.theoildrum.com/node/6157 It was pointed out the dangerous situation of western europe depending more and more on a single supply for its NG coming from Russia. Nord Stream will be able to flow even more Russian gas into the UK (via Germany). The geopolitical instability of this energy dependence is obvious. As Norwegian gas exports decline the UK will become more and more dependent on staying warm courtesy of its old ideological enemy "The Evil Empire" (Yes Reagan Termed it but Thatcher was right with him). Gordon Brown has announced a major nuclear power program with a hoped for 20 nuke stations by 2020. The government knows the mess the UK is in re its energy supplies. The panic has begun. I'm not sure the U.S. is in any better shape. We may have more NG, but at the expense of ruining water sources by fracing shale oil. This country has also lost much of its manufacturing, instead buying most of its day to day products from China. The U.S. is dependent now on so much added debt each year, its just a matter of time before the SHTF. It will be interesting to see what the West decides to do in the face of an obvious longterm economic decline into the abyss, while Chindia seems to be barreling ahead with massive growth. What happens if the U.S. cannot repay loans to China? It's going to get weird and dangerous! At least we are not going to run out of gas, obviously! You've reminded me about the Russia-Ukraine situation last your, when Ukraine was simply sitting without gas for sometime during practically half of the year! These guys are alot to learn from the developed world on the maintenance of such things. Although it is quite understandable as they all have been one country just a while ago, so it appeares hard to manage such sings with your "raletives". At least we are not going to run out of gas, obviously! It's a relief to learn that we have infinite natural gas resources in the US. And now we have basically entered into the greatest illusion I’ve ever heard of, that luckily if you never worry about this shale gas is going to last well into the 21st century. It's that we create our own reality. Indefinite exponential growth is not only possible, but desirable. And, the invisible hand will magically solve all problems. If only - panic would be a massive improvement over the mixture of complacency and ignorance that seems to be the rule at the moment. The UK (just like the USA) has destroyed its manufacturing base and given away lots of its fossil fuel wealth becoming in the process a net importer of both goods and energy. To keep the economy humming the UK became a financial economy and expanded immigration and the development of the unsustainable suburban consumerist lifestyle. We know now what a disaster this has been. We are watching a first world nation convert itself into an overcrowded poor (bankrupt)third world nation. The major problem is how short term thinking is painting us into a long term corner - if there was less immigration the UK population would already be in decline (birth rate is well below 2 children per woman and around 25% of those children are born to non-UK born parents). The short term problem is that this makes the population so elderly dominated that pensions cannot be paid and allowing immigration has made up the difference (and probably pushed wages down as well). The question is what happens now - does net immigration (especially of the under 40s) stop so demographic change can be allowed to solve some of the problem (it is probably too late though). The other worrying thing is at least in parts the US seems even further down this road than here. retirement out by 5 years. My private pension pot is worth barely more than the cash that I and my employer have put into it. It is stuck in stockmarket investments that I cannot legally withdraw from. With the inevitable decline of the NHS and the demographic squeeze, I don't expect to live long enough to reach the receding horizon that will be the official retirement age. I am fortunate in that I have some income from property. Putting the rest of our cash savings into more property should set us up a reasonable retirement income for my wife and I if I judge the market timing correctly. (By reasonable, I mean relative to national average real income. People will always need homes, but they can only pay the rent that they can afford). My other pension is my (adopted) children. I cannot morally expect them to do more for me than I have down for my parent's generation, but that would be enough to keep me going another five years. In exchange they will inherit some property, if the government doesn't seize it. RalphW, some good news for you, the current State Pension Age for a man of 47 is a mere 66 not 70 so less than 19 years to go!! Of course anything can happen in the next half hour so it may well change before then. Also in last night's debate our beloved (not) Chancellor Darling slipped up and revealed that Labour have given up the idea of a "death tax" to fund social care for the elderly, so that just leaves inheiritance tax if you don't arrange your affairs in advance. The Brits voted to follow our lead. How is natural gas actually stored? I have seen the huge round storage tanks at a refinery but they hold liquids. Is the gas stored in tanks, or salt caverns, and at what pressure? How much of the gas is lost in purging and then occupying the storage vessel? I remember some discussion last year about the volumes of gas required to simply fill the pipeline through Ukraine, and the dispute over whose gas was used to fill the line. You're right that gas pipelines themselves are a storage medium. The recent pipleline laid to carry LNG from Milford Haven in Wales to Tirley in Gloucestershire uses 1220mm (48 inch) pipes. I wish I'd taken photos when it was under construction. Interestingly, the full capacity of this pipeline cannot be used because of the need to build a new Pressure Reduction Installation at Tirley, which is facing intense local opposition. "The Planning Committee of Tewkesbury Borough Council met on Tuesday 2nd February 2010. They decided to refuse planning permission for National Grid to build the pressure reduction installation at Tirley." This is madness. This is likely Brierly Hill Book Club blocking an international rail link. The UK Gov spoke about fast-tracking nuclear power plant planning permissions (by ignoring local planning objections), perhaps they should do the same here. This is a national level issue that should not be decided by a Borough Council of all things! Well, the National Grid for Gas should have got planning permission for the whole project before starting any of it, IMHO. The madness is in our fixation on "big projects" and fossil fuels, not local opposition. But it does have the air of an Ealing movie about it. "Passport to Tirley", anyone? A "nation" is the sum of its local communities. If none of these local communities support the government approach to a "national level issue", then essentially the nation doesn't support the government's approach. Tyranny is then only a very temporary solution, where perhaps other solutions would be better. As I am now aware of there are three storage concepts in use in UK. Abandoned gas reservoirs (like Rough). Salt caverns (leached out of the ground at 1000 m depth). The pressure may vary and for salt caverns and reservoirs it is around 100 bar g.
Gas reservoirs and salt caverns need what is often referred to as cushion gas to become operational (in other words a certain amount of natural gas needs to be present to allow for withdrawals). Gas being used for withdrawals is often referred to as working gas. Due to the compressibility of natural gas it is possible to store some gas in the pipelines (often referred to as line pack). The amount is dependent on the volume of the pipeline (diameter and length) and maximum operating pressure for the pipeline. Line pack is commonly used by the pipeline operators. Red -- to add a little more to Rune's comments some would think the simple solution would be to add more storage. LNG surface storage is very expensive and only applicable in the transportation phase. The next big problem is the availability of suitable underground storage. An abandoned pressure depleted NG reservoir has one great advantage: it already has cushion NG in place. On the downside the withdrawal rate is limited to the natural flow character of the rock. And withdrawal rate will always be a key issue. I'm sure someone has floated the idea of using pressure depleted N. Sea fields. But that also adds a significantly operational costs. A salt cavern, as we have many in Texas, is idle in many ways. Huge withdrawal rate potential: many times greater than a conventional well. But not ideal from cost considerations. In addition to needing a salt body, the excavation isn't cheap. In a few weeks I'll be drilling a deep exploration well on the flank of the legendary Spindletop Field. Complicating this effort is the presence of 4 salt water disposal wells nearby. A new cavern (called a capsule locally) is being leached out of the Spindletop Salt Dome. Daily 1.3 million gallons of brine water is being pumped down these wells to a depth of 5,000'. And that's after the leaching wells have daily pumped down 1.3 million gallons of fresh water into the salt body and then pumped 1.3 mg/day back to the surface and then pumped 1.3 mg 6 miles to the disposal wells. I can't estimate the total cost of the leaching phase but you can imagine the horse power alone to move this much water for many months. But that still isn't the major factor. A new capsule might require as much as 20 billion cu ft of cushion NG. At $5/mcf that $100 million of purchased gas that will sit idle for as long as the capsule is functioning. Essentially the same as putting $100 million (that you probably borrowed in the first place and are paying interest on) into a bank and not drawing any interest on that money for the next 30 years or so. NG storage can be a good stable investment. But takes a huge capex to make it happen. There are some storage facilities under construction in U.K. which may add around 300 Mcm by 2013/2014 (Aldbrough have been in operation for some months). Further one FID (Final Investment Decision) has been approved and then some storage projects have received planning permissions. Storage is as you point out, very expensive, but the costs will anyway be passed through to the end user. Another thing which has been pointed to on several occasions here on TOD is how to finance such projects as credit has dried up and investors looks for a reasonable return. I know for sure that there has been looked into using other depleted gas fields on UKCS for storage. Rune -- Are they utilizing salt caverns or old fields? Are the NG storage facilites regulated by the gov't like a utility or are they essentially private enterprises? Here the return on investment is controlled by the pass through volume and the price swing for the most part. But some of the storage is used as a very short term buffer and are tied into the utility companies so they have some fixed expectation of profitability. I get the sense that Brit NG storage is more controlled by the gov't then not? I am not into the detail of how the U.K. storage enterprises are regulated. Rough the biggest (LRS, Long Range Storage), located offshore, U.K. storage facility is a natural gas reservoir converted for storage use. The MRS (Medium Range Storage) facilities are as far I know, salt caverns. The SRS (Short Range Storage) facilities are LNG facilities. Thanks Rune. Since you've done all the work so far I'll see what I can dig up on the regulatory issues. Salt dome storage is probably the most valuable kind (in the US) because of the huge injection/withdrawal rates which are possible. ROCKMAN is right that it takes a lot of money to buy the base gas, and/but depending on the owner of the facility they can trade the base gas around. Generally the bulk of the storage capacity is sold before a facility is built on capacity rights basis. The capacity is expressed in mcf/cycle. What that means is that if a dome holds 100 mcf (making up numbers here) and it can be filled and drained 8x per season (fill rates are generally a fraction of the extraction rate) the customer can buy up to 8x100=800 mcf of storage at a certain price. The number of times a dome can be filled/drained is a function of geology, pipeline size, and compressor size. Because of the uncertainty of gas flows operators/users need the right to store gas though they may not use it. Pricing therefore tends to take place on a fee+cost basis: Somebody who wants storage capacity pays a fee per mcf plus costs like insurance and natural gas. The natural gas is used for two purposes – fueling the compressors to pump the gas up to about 3000psi and to heat the gas when it is drained. Here is the output of the UK Met Office High Resolution North Atlantic and Europe (NAE) forecast model for precipitation at T + 48 and accumulated snow depth. If most of the really cold air and snow is confined to the Northern half of the UK that will really help as most of the population lives in the South. This could be our last really cold blast of the winter. How long will it last is the question. The GFS has the colder air hanging on into the weekend but things can change at that distance. A cold snap in the north and west will not cause a large rise in NG demand. Most domestic NG is in the densely populated south east. We might see a small draw on storage for 2 or 3 days, but it is unlikely we will draw down more gas than has been stored in the spring weather this last week. This level of cold would need to last at least 2 weeks to seriously risk shortages. Although one fly in the ointment would be a major failure in the system somewhere over the next week. The Langeled pipleline is running at the full 70mcm/day right now and everything almost certainly should be ok as we move further into spring and summer. Fingers still crossed though! 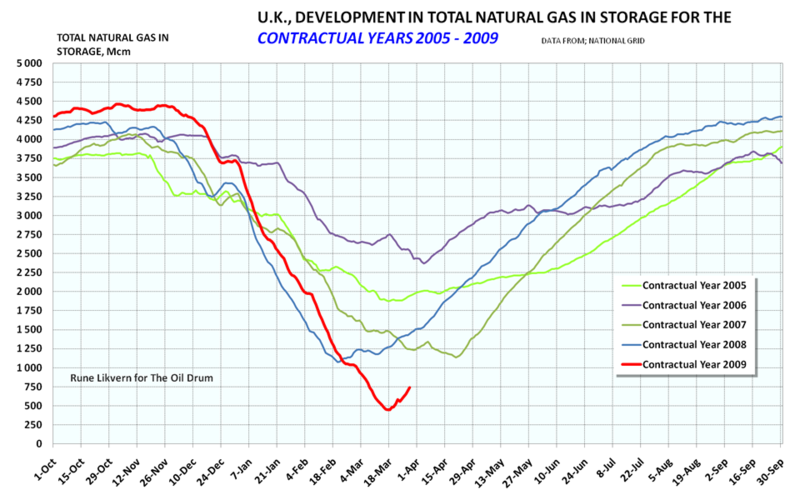 Diagram below shows development of total natural gas in U.K. storage as of this morning, Monday March 28th. As of now there is 700 Mcm less natural gas in storage relative to the same date of 2009. A cold snap calling for modest withdrawals could bring this gap to 8 - 900 Mcm in early April. rune, have you looked at storage levels on the rest of the continent? My understanding (per the GIE) is that they're well above historical levels. also, i suspect the amount of norwegian gas that can be diverted between bacton/st. fergus/easington etc and zee/ttf/emden is at least as substantial as the flows on the interconnector/bbl, not to mention the LNG that can be easily diverted betwen the UK and Spain/France. Clearly there's a risk that the next cold winter will - temporarily - empty the UK's gas storage completely. But that might actually be a good thing - the reality of depletion would come home to everyone in the UK, and hopefully the entire EU as well. Although the inadequacy of UK gas storage means that we will be first hit, the whole of the EU is banking, like us, on rapidly rising imports which may not be available - see http://uu.diva-portal.org/smash/get/diva2:285447/FULLTEXT01. The problem has been exacerbated by uncomfortably low prices for natural gas, compared with oil. As I recollect, in recent years the gas price has averaged about half the calorific-value-equivalent in oil. So, naturally, recent gas field developments are few and far between, and even a supergiant like Shtokman has been postponed. I use a search engine bing.ru, but what do you prefer?